Drummer Brian Woodruff has performed with Bobby Watson, Marian McPartland, Gary Versace, David Lahm, Harvie S, Eric Lewis (ELEW), Jiggs Whigham, Jerry Hahn, Adam Niewood, Toru Dodo, Peter Evans, Stacy Dillard, Ledisi, Melba Moore, and on the Today Show. Recently, Brian has been performed with James Spaulding, Rufus Reid, Rich Perry, Genes and Jazz at the Kennedy Center, The Flying Tomboulians, Return to Whenever, Akemi, and Marieann Meringolo. He has been the house drummer for mega-church Unity of New York for the last 14 years. As the founder and organizer of the Blackbird’s Session, he played with a revolving cast of some of New York’s finest jazz players during its 3.5 year run. Brian plays drums on upcoming releases with The New-Trad Octet, Dror Ben-Gur, the OKB Trio, and is featured on Jacob Varmus’ recent CD “Terminal Stillness.” “The Tarrier,” his first CD as a leader, has garnered rave reviews and critical acclaim. 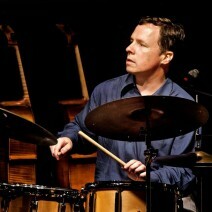 Mr. Woodruff received a Bachelor of Music in Applied Percussion from the University of Connecticut and a Master’s Degree in Jazz and Commercial Music from the Manhattan School of Music. Brian has over 25 years of experience as a private teacher and has given master classes around the US, including Indiana University, The University of Oregon, and Manhattan School of music. His teaching style includes his unique mix of humor, spirituality, and discipline. Brian is on the faculty of the Brooklyn Music School and New York Jazz Academy and is a founding member of the Queens Jazz OverGround.